Seahawks players Frank Clark, Ed Dickson, Poona Ford, Nazair Jones, and Malik Turner visited Seattle's Union Gospel Mission on Tuesday, November 20, 2018 to help serve four-course meals provided by Seattle chef Ethan Stowell to the ladies and families of Hope Place, a women's shelter run by UGM. 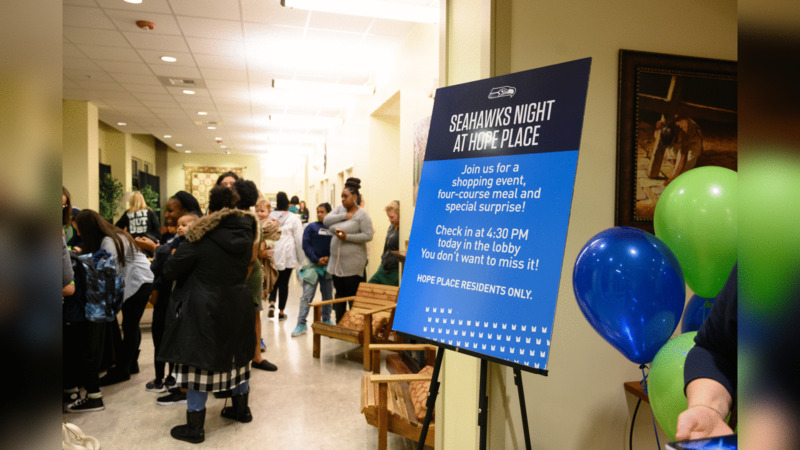 The Hope Place ladies were also treated to a free Pro Shop shopping spree, received new 70" televisions to watch Seahawks games, and enjoyed a night of dance in the cafeteria. Clark, who experienced homelessness as a child, has teamed up with UGM this holiday season through his #GiveYourBest campaign encouraging Seattleites to support the King County homeless community through avenues such as clothing donations, or financial gifts.